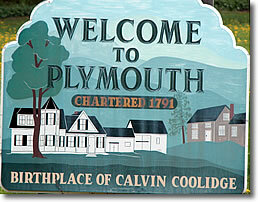 Calvin Coolidge was born in this tiny hamlet just off VT Route 100. You can visit the Calvin Coolidge Birthplace, Homestead, and a wonderful VT cheese factory. The former president's early history is interesting, but the story of his inauguration is full of fascination. In August 1923, during his term as vice president, Mr. Coolidge returned for a vacation to the tiny Vermont hamlet where he was born (July 4, 1872). Before he could even relax from his journey, the news arrived that President Harding was dead, and that he, Calvin Coolidge, was the 30th president of the United States...but he had to take the oath of office! The only qualified judicial official to administer the oath was the hamlet's notary public , who happened to be the new president's own father, Col. John Coolidge. Thus it was Colonel John who administered the oath to his son by the light of a kerosene lamp at 2:47am, August 3, 1923. 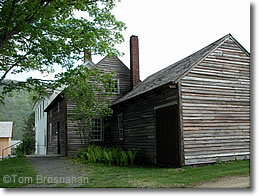 The Calvin Coolidge State Historical Site now includes most of the hamlet. You can visit the Homestead, the Birthplace, the Wilder Barn (a farmer's museum), the village church, the cemetery where President Coolidge is buried, Wilder House (once the home of Coolidge's mother), and a working cheese factory. Here's more on Vermont artisan cheeses. From Woodstock, follow US Route 4 west, then VT Route 100A; scenic VT Route 100, the main north-south road through central Vermont, passes one mile west of Plymouth.